An international student from India, Patel spent many nights researching the perfect university that fit all of his needs. He was looking for a school where he’d have access to all of the tools and guidance from professors he required — and that university was UWinnipeg. Currently, Patel is working towards his Bachelor of Science (Hons) in Mathematics. Once completed, he has high expectations for the rest of his education and future career. Jody Krahn loves statistics because she’s able to work on real-life problems by collecting, analyzing, interpreting, and presenting data. Coming to UWinnipeg, Krahn had initially planned to major in psychology. However, while taking a statistics course as a requirement, she was encouraged by professors to consider taking additional courses. She took their advice and soon switched to a statistics major. It was that personal interaction with professors that factored heavily in her decision to not only change her major, but choose UWinnipeg for her undergraduate studies. Krahn is dreaming big. Once she graduates with her Bachelor of Science (Hons), she intends to pursue a master’s degree in biostatistics and work in the health research field. Blake Madill, UW Undergraduate BSc Honours in Mathematics (U.MATH.BSCH) recently earned his PhD under the supervision of Dr. Jason Bell at University of Waterloo. His research area is a blend of noncommutative ring theory and combinatorics on words. Blake's thesis was titled Contributions to the Theory of Radicals for Noncommutative Rings. In 2018 Blake became a Lecturer within the Department of Pure Mathematics at the University of Waterloo. UW Math/Education student Jehu Peters was Valedictorian for Faculty of Education Fall 2015 and is now teaching in Winnipeg. 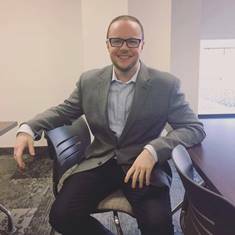 Congratulations to Blake Madill who received a full PGA NSERC scholarship for his first year of graduate studies at University of Waterloo and recently was accepted into their PhD program. Blake also worked with supervisor Dr. Rampersad at UW during the summer months of 2012 with a USRA NSERC scholarship. Three “Intrepid” Students Awarded Prestigious Scholarships - Two in Mathematics: Matt Morison and Paul Sarte Read their stories here. 2009 NSERC USRA SCHOLARSHIPS were awarded to Ian Crump (supervisor T. Visentin), and Alyssa Vergata (supervisor A. Stokke). 2008 NSERC USRA SCHOLARSHIPS were awarded to Ian Crump (supervisor O. Oellermann), Mike Pawliuk (supervisor Ross Stokke) and Jenna Tichon (supervisor R. McLeod). Congratulations to Erik Youngson and David Janzen on getting NSERC graduate scholarships. This year ten students from the U of Winnipeg obtained NSERC scholarships. Jennifer Asimit (nee Prokop) completed her B. Sc. with a double major in mathematics and statistics from the University of Winnipeg in 2001. She obtained both her M.Sc. (2002) and Ph. D. (2006) in statistics at the University of Western Ontario, while being funded by an NSERC PGS-A (2001-2003) and NSERC CGS-D2 (2003-2005). During her graduate studies she received the Canadian Journal of Statistics Award for the best paper of 2005: J. Asimit and W. J. Braun (2005) ``Third order point process intensity estimation for reaction time experiment data", The Canadian Journal of Statistics, Vol. 33, No 2, pp. 243-257. Congratulations Jennifer! 2005 for NSERC USRA scholarships go to Susana Wieler, Kyle Vincent and Grzegorz Skubisz. Joel Peters-Fransen, UW B.Sc. Math Honors, 2006 graduated with a master's degree in pure mathematics at the University of Toronto in August 2007. Joel graduated from Harvard Law School in Spring 2010 and is now working at a U.S. firm with U.S. tax law. If you are a UW Math or Stats student, email the association to find out information about joining the UWMSSA and getting yourself on the mailing list. There are always presentations and social events scheduled, so join up, attend, and you'll usually even get some refreshments with the talks! Congratulations to Erik Youngson, UW Statistics student, for being awarded an NSERC Undergraduate Student Research Award (USRA). Erik worked and studied research over the summer months under the supervision of Dr. Sanjoy Sinha of the Math/Stats Department. Congratulations to Shonda Gosselin and Sean Fitzpatrick for being awarded NSERC PGSA Scholarships for their future Graduate Studies. Sean Fitzpatrick: His passion for math and physics may not be the norm, but it has been the driving force behind a fruitful academic career and a published paper, a bona fide success story for any undergraduate. Fitzpatrick's high academic standing, research experience, and leadership abilities earned him the Sir William Stephenson Scholarship. What he's been working on most recently involves numbers and patterns. That was the subject of his first published paper, one he co-authored with James Currie, mathematics professor and former Chair of the Department. Dr. Currie presented the paper at a conference in Japan. His second paper, an extension of his work on sequences of symbols, has also been submitted for publication in a refereed journal. Sean has served as a research assistant, assisted with math labs and assisted the professors in marking term papers. He was also the past President of the UW Math/Stats Student Association. Sean's studies lie in Physics and Applied Mathematics and he earned his PhD at the University of Toronto. The NRC awarded its Women In Engineering and Science (W.E.S.) to Laura Kasian, a second-year Mathematics and Physics student at the time, as the sole winner from among Manitoba's four universities. The prestigious W.E.S. award finances the remainder of Laura Kasian's undergraduate career. For the next three years her summer job will consist of collaborating on projects with NRC researchers. The award represents a great opportunity for any Science student, and a finishing link to the chain of support that Laura has received at the University of Winnipeg. In addition to receiving an entrance scholarship and having the opportunity to work as a marker/demonstrator in the Department of Mathematics & Statistics, Laura was able to spend the summer of 2000 researching applications of Mathematics in Forestry with former department chair James Currie. Starting her research career at such an early stage has given her insight into the kind of work she hopes to do in the future. "I'm still not exactly sure here I want to specialize, but I thoroughly enjoyed working in a lab setting." Dr. Currie says that 85 percent of the mathematicians in the department are active in research, and that of these over 80 percent have been awarded funding in national competitions. Thus the department is able to hire student researchers and provide research opportunities early in students' academic careers.